A blog designed to share information on fruits and vegetables grown in Placer and Nevada counties. According to the latest map published by the U.S. Drought Monitor, all of California is now experiencing “severe” to “exceptional” drought conditions (click on http://droughtmonitor.unl.edu/Home/StateDroughtMonitor.aspx?CA to view the map). Those of us who live, farm and eat in Placer and Nevada Counties can be somewhat thankful – we're only living through “extreme” drought – folks in the San Joaquin Valley, southern Bay Area and Central Coast are dealing with an “exceptional” drought. Farmers in these regions will get little – if any – surface irrigation water; many will try to survive by pumping groundwater. The local outlook, while serious, is not quite so bleak. The irrigation districts that serve most of the farms in Placer and Nevada Counties (the Nevada Irrigation District and the Placer County Water Agency) have asked customers to voluntarily cut back on water use by 15 percent. Both agencies have indicated that they will be monitoring water use during the course of the summer – if customers haven't reduced water usage voluntarily, the irrigation season may end early (sometime in September, most likely – rather than the normal end date of October 15). So what does all of this mean for local farmers – and local eaters? Those of us with grazing livestock have already felt the impact - we've sold animals or purchased hay. Most small-scale vegetable and fruit growers will probably be able to get by during this growing season. Late summer will be the critical period – if July and August are exceptionally warm, a voluntary 15 percent reduction will be difficult to achieve. If non-farm users of irrigation water don't cut back on their water use, the 15 percent reduction will be difficult to achieve. An early end to the irrigation season could impact the availability of fall and winter vegetables especially. Since fruit trees generally set their fruiting buds during the summer prior to the next year's bloom, the impacts of this summer's drought may not be evident until next summer. Severe drought stress could impact tree fruit production for several years – we'll have to wait and see. Those of us who enjoy local food may notice higher prices for our favorite fruits and vegetables at the farmers' markets and at places like the BriarPatch and Newcastle Produce – due simply to the laws of supply and demand. Use only a full dishwasher and clothes washer – don't wash partial loads. Don't let the water run when washing, brushing your teeth or shaving – turn it off and on as needed. Take showers instead of baths – a 10 minute shower with a low-flow showerhead uses half the water of a regular bath. If your shower takes a while to warm up, place buckets in the shower to use for watering plants. Do the same for the kitchen faucet. Avoid flushing the toilet unnecessarily – don't use water for garbage! Dispose of tissues, insects and similar waste in the trash rather than the toilet. Save the water from steaming or boiling vegetables for house plants, vegetable broth for soup, or stir-fry liquid. Use the sink basin or a wash tub for hand-washing dishes instead of free-flowing tap water. Apply mulch to your garden and flower beds. A 3-4” layer of mulch can reduce watering needs by as much as 50 percent. Grass clippings, dry leaves, pine needles, straw and shredded bark can be used as mulch. The best time to water your garden is in the late evening and early morning. Lower temperatures and limited wind will reduce water evaporation rates. Install a drip irrigation system. Drip irrigation is much more efficient than overhead watering with sprinklers. Control weeds! Weeds compete with vegetable and landscaping plants for water. Consider drought resistant landscaping and vegetable plants. Contact your local UCCE Master Gardener for tips on varieties. Determine the amount of fruits and vegetables your family will use – don't waste your production! Monitor soil moisture to determine when your plants need watering. Check pipes, irrigation lines, valves and sprinkler heads for leaks. For many of us, eating locally is a matter of taking personal responsibility for our health and for our community. As part of this responsibility, we should also educate ourselves about water use and farming. Check out this interesting article from Mother Jones: http://www.motherjones.com/environment/2014/02/wheres-californias-water-going. I also encourage you to check out Farmer and Rancher Voices from the Drought on Facebook (www.facebook.com/voicesfromthedrought). Farmers and ranchers from throughout California have been posting information about how this historic drought is affecting their operations. Remember – every drop of water counts in a year like this! 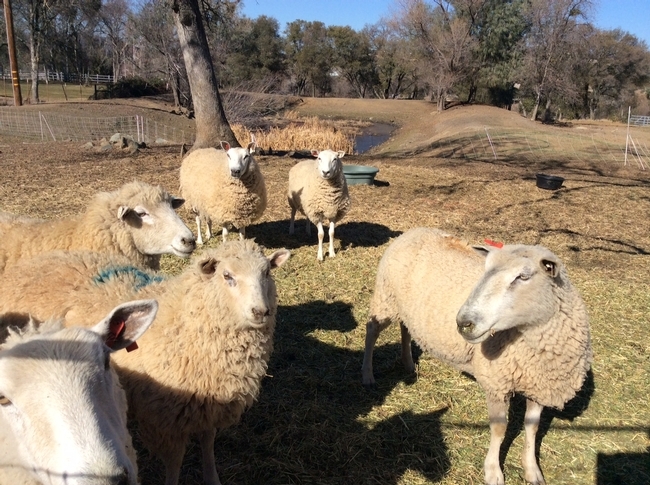 Dan Macon and his family operate Flying Mule Farm, a commercial sheep ranch, near Auburn, California. Dan is also a program representative for UC Cooperative Extension's Eat Local Placer and Nevada project. Fall Colors at the Farmers' Market!